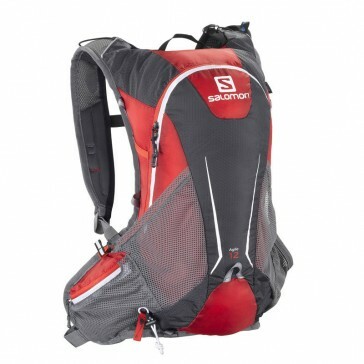 A very simple and lightweight trail running backpack that holds 12 liters. It stretch material used to suit any type of movement to be. Thus, a perfect fit was created. The backpack is particularly in the areas of suitable mountain biking and high level sports. This newly designed shoulder straps now promise speed, agility and lightness. This lightweight and with the right material in the right place to improve air circulation and reduces friction on the shoulders and around the neck. This system allows to select each accessory attach easily to the backpack. Front pocket: Can easily slide on the waist belt and can be attached to the light, concealed buckles at the shoulder. Water bottle holder: Easy plugged onto the shoulder or hip. This is used to attach the walking sticks on the backpack. Can also be used for helmet attachment. This system is the best back wall design that provides optimal freedom of movement while running. Especially with stability, light weight and comfort it will meet the requirements. It is a combination of a soft backboard that adjusts the back and ensures a perfect fit, vohanden. Minimalist EVA padding on the sensitive points also ensure comfort and protection. Perforation increases ventilation and breathability. Moisture wicking materials for the disposal of welding. Ventilation ducts for cooling of the back.